Listen to the full 46-minute vérité radio documentary recorded during the Freedom Ride that was (eventually) broadcast on ABC Radio in 1978. 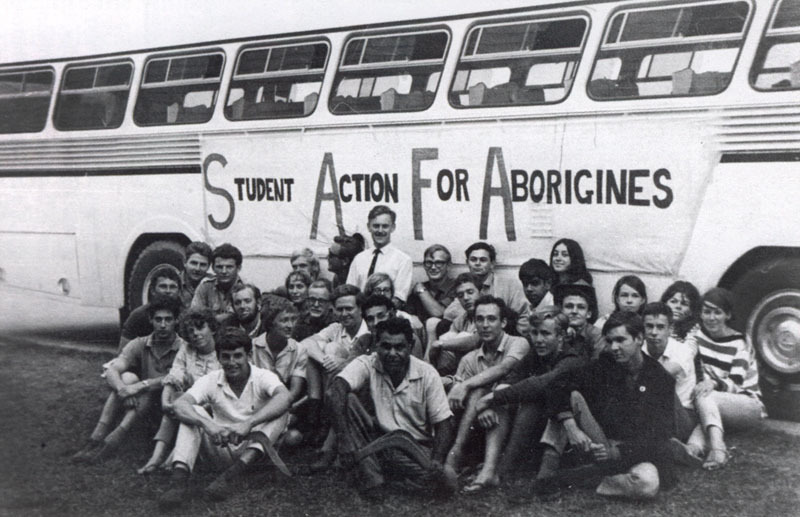 Inspired by the Freedom Rides of the American civil rights movement, a group of Sydney University students led by Charlie Perkins and Jim Spigelman set out on their own Freedom Ride - a bus tour around the racist interior of rural New South Wales. The Ride included a survey of Aboriginal living conditions, a direct challenge to a ban against Aboriginal ex-servicemen at Walgett RSL, and a demonstration against local laws barring Aboriginal children from the Moree swimming pool. Perkins and his group ensured their protests were covered by the media, bringing the issue of racial discrimination to national and international press attention, and stirring public debate about the disadvantage and prejudice facing Indigenous people across Australia. Amongst the Freedom Riders was Darce Cassidy, an arts/law student who was also a part-time reporter for the ABC. The vérité-style radio documentary he made about the Freedom Ride was such a political hot potato in that era that the ABC did not dare broadcast it until 13 years after the event in 1978 !! !